Last month, Eli Rosenbaum was the featured speaker at the Long Beach Jewish Community’s Yom HaShoah Commemoration. 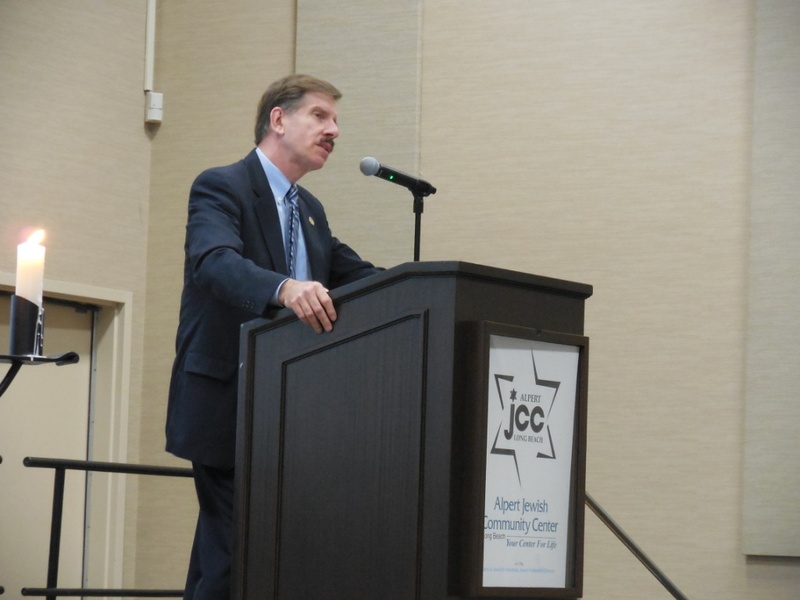 Taking place on Sunday 19 April at the Alpert Jewish Community Center, Rosenbaum spoke about seeking justice for the Holocaust. Rosenbaum, who had been, for over a decade and a half, the Director of the US Department of Justice Office of Special Investigations and has been the Director of Human Rights Enforcement Strategy and Policy, also in the US Department of Justice, for the past five years. One point that Rosenbaum made sure to make was that, despite Hollywood movies depicting many things, there are no Hollywood movies depicting Holocaust exterminations or killings. He pointed out that studios could easily show us realistic violence and gore of Holocaust, although, he supposed the reason that the studios have not done so is due to their thinking that audiences could not bear to watch such atrocities. He used one particularly sad and gruesome story of 90 children – from only a few months old up to 7 years old – locked in a house who were suffering for a while, before being executed by Ukrainians. One particularly remarkable element of the story was that German soldiers were tasked with killing them and they could not bring themselves to do so, so they relegated the task to Ukrainians. A big part of his talk, though, was not so much on the Holocaust, but on pursuing justice in America against Nazi war criminals. Indeed, he pointed out that “the US has had the most successful and most aggressive prosecution of Nazi war criminals.” Rosenbaum offered the audience several cases of Nazis his office had found in California. He said time is running out to prosecute any remaining Nazi war criminals, as they are dying out. “The very examples of Europeans to save Jews show” that it was possible to save them, said Rosenbaum, and that it wasn’t all Europeans who wanted the Jews killed. Rosenbaum said that the Allied governments could have ended the concentration camps earlier, however, they did not. Nevertheless, “the crimes of the Nazis were perpetrated by men and women” and it is his department’s responsibility to prosecute them. The post-Holocaust imperative of “Never Again” has caused Jews to be at the forefront against genocide. It’s even better that we should try to stop atrocities before they get big. I had never heard him before, but I found him to be an excellent speaker, both in terms of his content, but also due to his strong and forceful style fueled by a personal passion. This passion may be largely in part due to his being the child of Holocaust survivors.